Looking to identify the marketing from theSarketing? Click here to receive a free overview “The only 5 real characteristics of a Unique Selling Proposition�? While marketing may want to believe that a graphic element or a pristine brand are differentiators, in sales situations materials that help to prove the point are a lot more valuable . Discover the Difference SARKETING® Can Make. If you're like most executives, your responsibilities revolve around meeting multiple demands and putting out constant fires. Your days are full - and you don't have the time, resources or funds to invest in efforst that don't deliver significant returns. So how do you maximize your investment in getting to market? By bridging the gap between your marketing and sales efforts with a distinctive blend of services and tools we call SARKETING®. 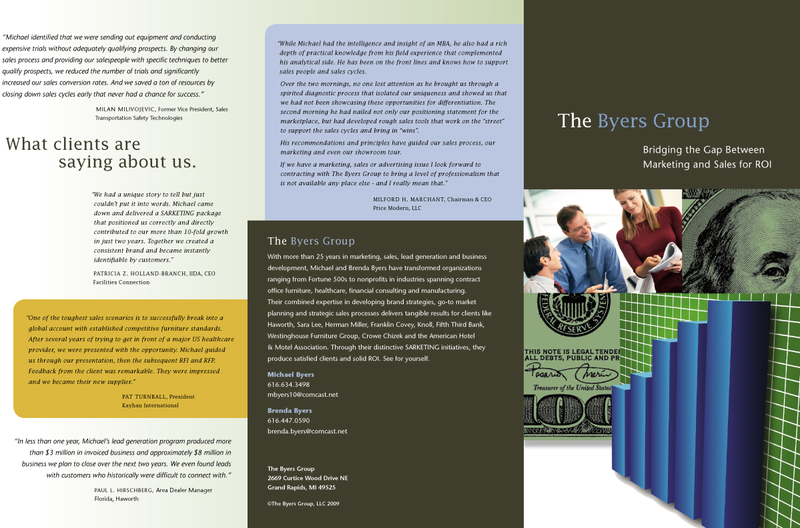 While we offer a full range of services, SARKETING is unique to the Byers Group. SARKETING is a toolkit of marketing efforts that reinforces and advances each stage of the sales cycle and has a continual focus on winning business and your ROI. We work with you to craft a comprehensive toolkit that reinforces your sales efforts, establishes differentiation and wins you business. Test: Do they help advance the sales process?